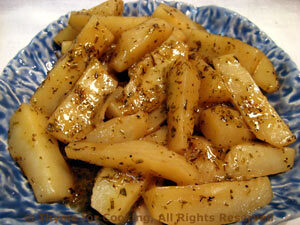 Sunchokes (Jerusalem Artichokes) Thyme for Cooking easy vegetable side dish. Braising can add a lot of flavor to vegetables as well as meats, usually with little or no added fat. I added Herbes de Provence to these but almost any herb will work: thyme, basil, marjoram, rosemary. Peel sunchokes using a vegetable peeler. Cut into sticks about 1/2" (1cm) square by 2 " (5cm) long (or however long the sunchoke is). Put into a small skillet or medium saucepan. Add stock and herbs, cover and bring to a boil. Reduce heat and partially uncover. Simmer until tender and most of the stock is gone, 15 - 20 minutes. Remove, drain if necessary and serve.